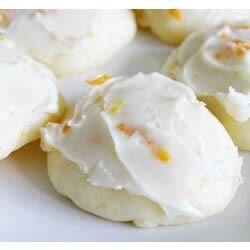 "Delicious cake-like cookies with orange frosting." In a medium bowl, cream together the margarine, sugar and sour cream until smooth. Beat in the eggs one at a time, then stir in 3 tablespoons orange zest. Combine the flour, baking powder, baking soda and salt; stir into the sugar mixture alternately with 2/3 cup orange juice. Drop by teaspoonfuls onto ungreased cookie sheets. Bake for 8 to 10 minutes in the preheated oven. Allow cookies to cool on baking sheet for 2 minutes before removing to a wire rack to cool completely. In a small bowl, stir together the melted margarine, confectioners' sugar and 1 tablespoon orange zest. Mix remaining orange juice in 1 tablespoon at a time until desired consistency is reached. Spread over cooled cookies. These were pretty good at first. But they got kind of soggy. I also had a terrible time getting the frosting to be the right consistency. I had to add a lot more powdered sugar. If you enjoy soft cookies you will LOVE these.I made the folloiwng changes; butter instead of margarine and I doubled the frosting! Delish! Co-workers were ridiculously enthusiastic. Wish I'd doubled the frosting, though.